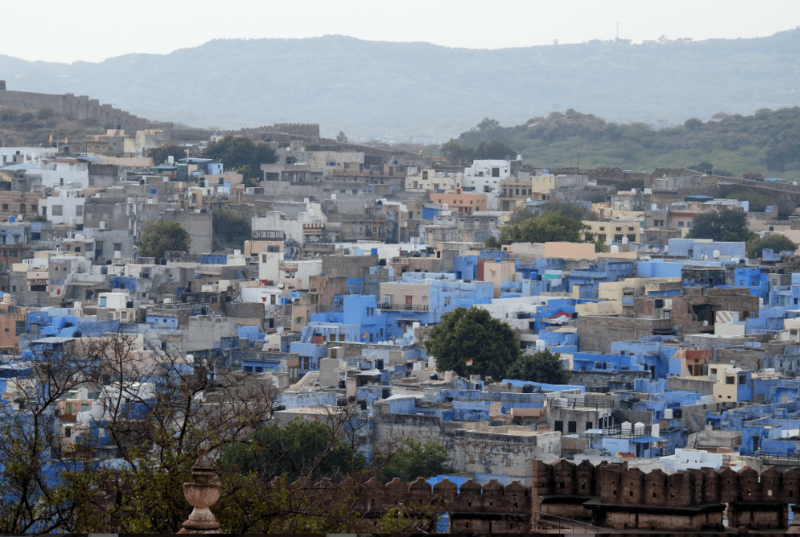 Jodhpur, the second largest city in Rajasthan may be known by the moniker of Blue City but it has a lovely mix of art, culture and nature. So here are our top five recommendations on things to do in the city. The fortress of Mehrangarh dominates the landscape of Jodhpur and is set on a rocky ridge with eight gates at a height of 125 metres. This historic fort has stood the test of time and many a battle and you can see the imprints of cannonball attacks on its second gate. The fort is majestic and houses many smaller halls within its impregnable precincts. The entrance to the fort itself gives a sneak peek into the architecture. The latticed windows, carved panels and wall paintings are intricate and stunningly beautiful. There is an elevator to go up as well, but being crowded, it is better to walk it up. At the foot of the fort is the Chowkelao garden that is about 200 years old and has been recently restored. There are artists who play musical instruments on your way up so there is much to see and hear! The Mehrangarh museum has an interesting display of arms, textiles, palanquins, headgear, paintings and manuscripts. Moti Mahal or the Pearl Hall with glass windows and five nooks is where the king held his audiences. When here check Sheesh Mahal the glass palace whose walls are covered with intricate mirror work on the floor and ceiling. Phool Mahal or Flower Hall is the grandest room and it is said that the gold used here came from Ahmedabad! 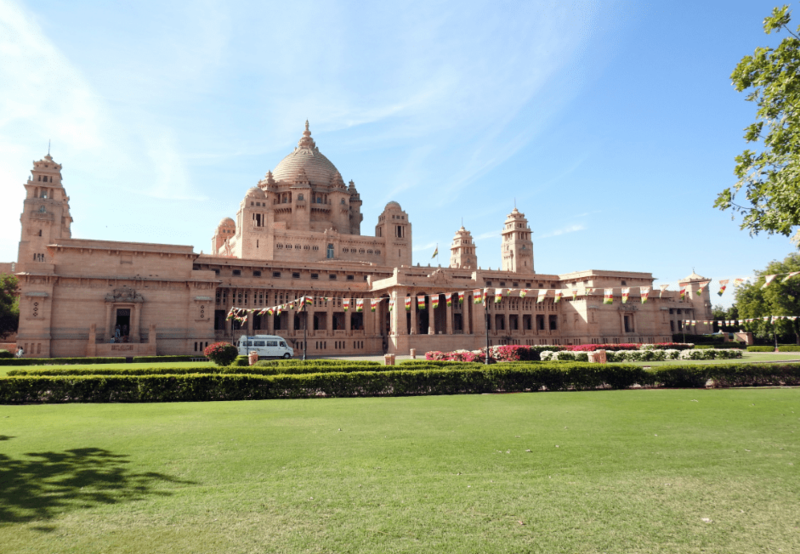 While today Umaid Bhawan Palace may be in the limelight for hosting some of the most high profile weddings, it is actually the residence of the royal family too. A portion of the palace in fact continues as the official residence of the royal family even to date. With a jaw dropping 347-rooms it finds place among the largest private residences in the world. Built in Indo European style of architecture there is also a small display of vintage cars here. Built by Umaid Singh in 1929 to counter a famine this palace has been designed by renowned British architect Henry Vaughan Lanchester and took 16 years to complete. The private museum here has a special exhibition on Maharaja Umaid Singh and the making of the Umaid Bhawan Palace. The life style gallery here will take you back in time showcasing how the palace was in the 1940’s and 50;s and has interesting display of art deco furniture, dining and writing sets and a special sporting section., ‘The legacy continues’ gallery is dedicated to the current riyal family and their interests. A superb collection of antique clocks is also on display. 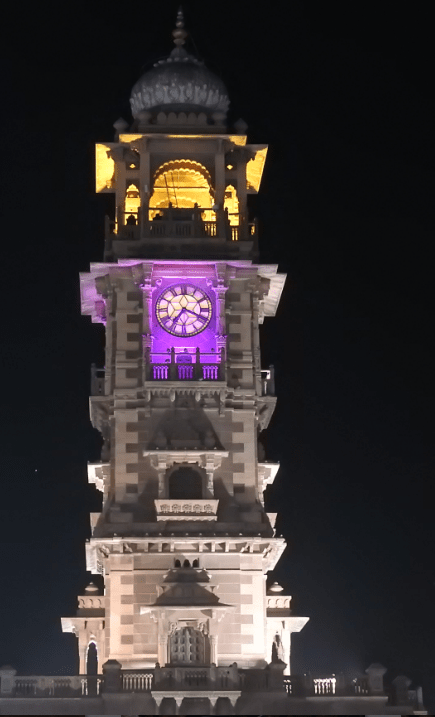 Ghanta Ghar or the clock tower built by Sardar Singh Ji of Jodhpur is in the midst of the bustling Sadar Bazaar. This is a market place that is abuzz with activity and the evenings are when the clock tower is lit up in different shades of light so you can get pictures that look different each time! 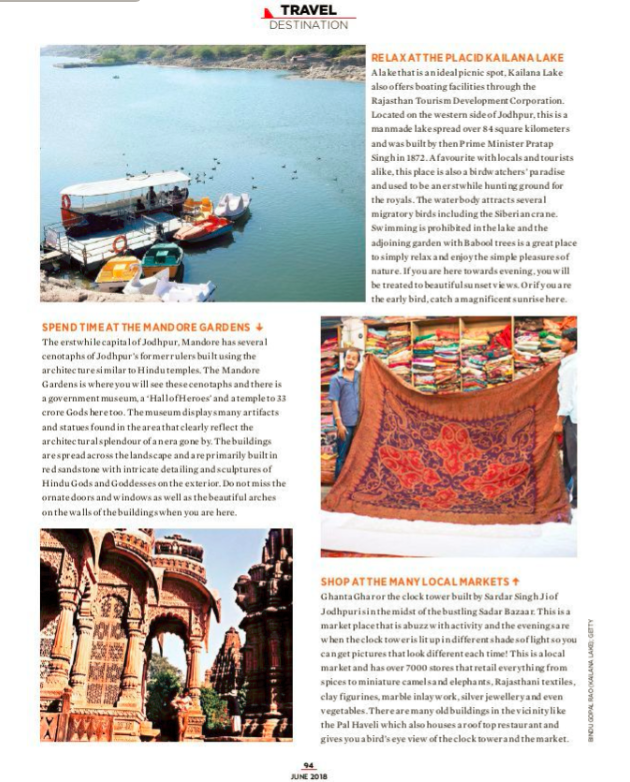 This is a local market and has over 7000 stores that retail everything from spices, miniature camels and elephants, Rajasthani textiles, clay figurines, marble inlay work, silver jewellery and even vegetables. There are many old buildings in the vicinity like the Pal Haveli which also houses a roof top restaurant and gives you a bird’s eye view of the clock tower and the market. 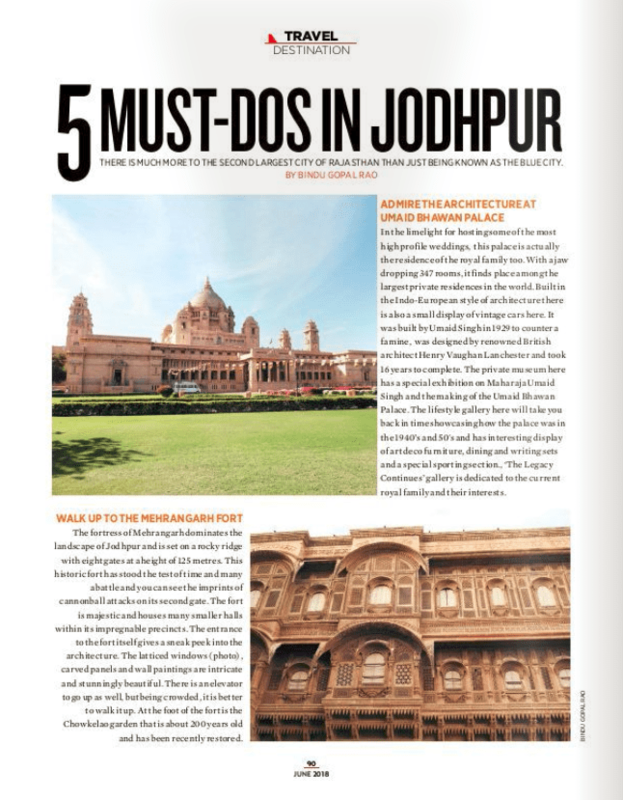 The erstwhile capital of Jodhpur, Mandore has several cenotaphs of Jodhpur’s former rulers built using the architecture similar to Hindu temples. The Mandore Gardens is where you will see these cenotaphs and there is a government museum, a ‘Hall of Heroes’ and a temple to 33 crore Gods here too. The museum displays many artifacts and statues found in the area that clearly reflect the architectural splendor of an era gone by. The buildings here are spread across the landscape and are primarily built in red sandstone with intricate detailing and sculptures of Hindu Gods and Goddesses on the exterior. Do not miss the ornate doors and windows as well as the beautiful arches on the walls of the buildings when you are here. A lake that is an ideal picnic spot, Kailana lake also offers boating facilities through the Rajasthan Tourism Development Corporation. 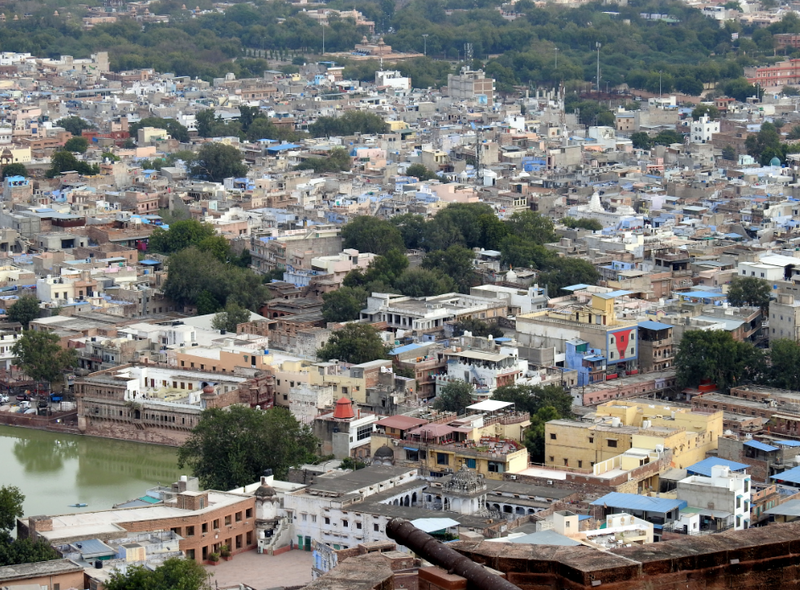 Located on the western side of Jodhpur, this is a manmade lake spread over 84 square kilometers and was built by then Prime Minister Pratap Singh in 1872. A favourite with locals and tourists alike, this place is also a birdwatchers’ paradise and used to be an erstwhile hunting ground for the royals. The water body attracts several migratory birds including the Siberian crane. 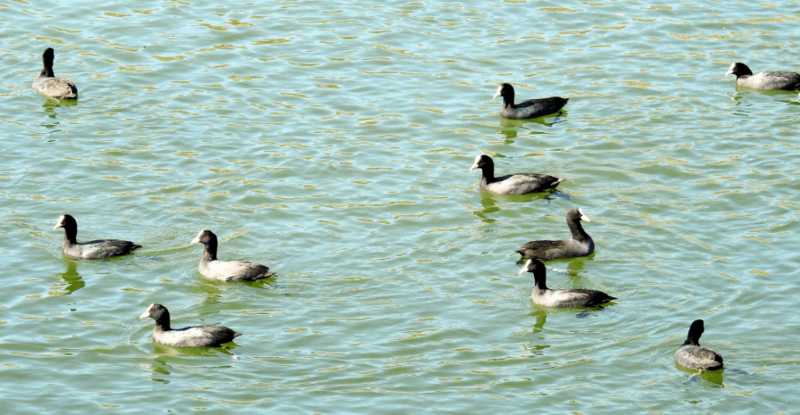 Swimming is prohibited in the lake and the adjoining garden with Babool trees is a great place to simply relax and enjoy the simple pleasures of nature. If you are here towards evening, you will be treated to beautiful sunset views. Or if you are the early bird, catch a magnificent sunrise here. Jodhpur has a rare breed of horses known as Marwari or Malani. Rao Jodha chief of the Rathore Clan is said to have founded the city. 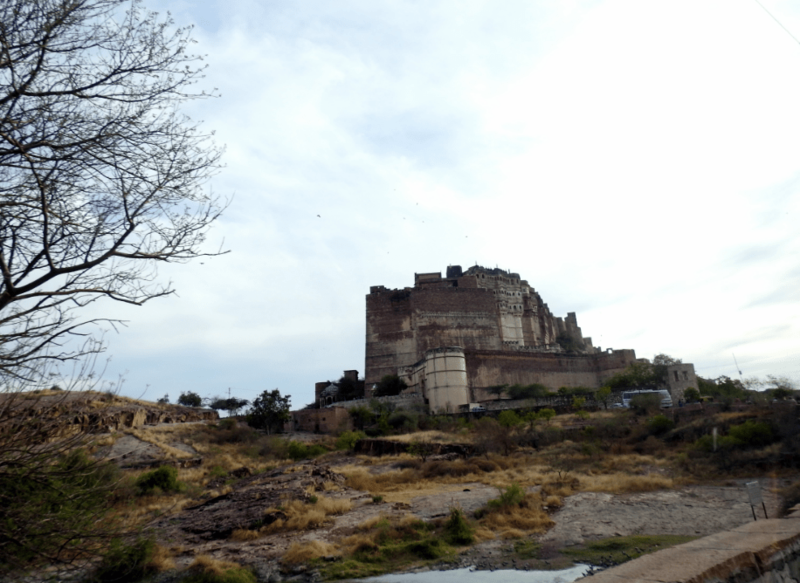 You can even zip line over the battlements and lakes of the Mehrangarh fort. Indeed it is Pushpendra, thank you.